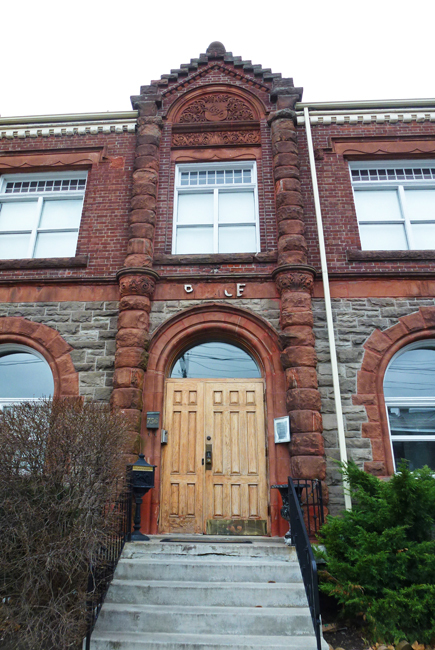 This Gothic Revival building was constructed in 1890 as the Ossington Avenue Police Station but now houses a day care centre. The building has heritage protection and looks as if it is being well maintained. Hello, it is a pretty building. I like the brick and stone work. Happy Sunday, enjoy your day and new week! From police station to day care, that is quite a change in mission. Is that the fragments of the word "Police" above the door? The stonework on each side of the door looks a little like totems Pat! I'm glad it's got heritage protection. I love these fine old buildings. Back in the day when stone masons were doing there thing. Love anything stone! That door might use a little TLC, though! Stone makes for a lovely building. Built to last! Have a Happy Day, Pat. This is a fine looking building. Glad it has found a good use since the police left. I've only visited Toronto twice but I remember a lot of older buildings made of red brick and stone. It that typical? It is a nice building. Interesting place for a day care center too! Lovely old stately building, and interesting change in occupants!